Family two-bedroom suite "Extra Comfort"
Homely cozy two-bedroom suite for family holidays with a total area of 28 m2 with a view of the town or a view of the hotel's inner courtyard is intended for a comfortable and long stay (up to 3-4 guests). The room has one bedroom, a separate living room with a convertible sofa that serves as an extra bed, and a large bathroom. The room is equipped with a flat-screen TV, a wardrobe with clothes hangers, a fridge, a phone, a table and chairs, a personal safe. 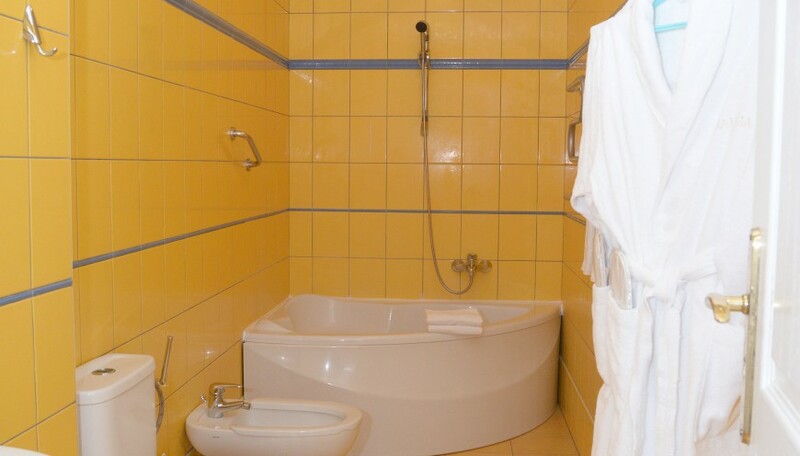 Bathroom with a large corner bathtub, with a hair dryer, a bidet, bathrobes, slippers and toiletries (soap, shampoo, shower gel, toothbrush and shaving sets, shower caps) will not leave indifferent even the most sophisticated guest and will help to relax after a hard day's work. While staying at the hotel, our guests can use the laundry service for an additional fee. Ironing board and iron are provided to the hotel guests free of charge on request. If you need a baby cot, please let us know in advance. * Interiors of the rooms of similar categories may vary slightly.